Keeping the home fires burning at Deer Valley. Serving food with grace and a smile is an art unto itself. Managing a half-wheel of semiprecious imported raclette as it melts beside a hot fire takes that art to masterpiece level. 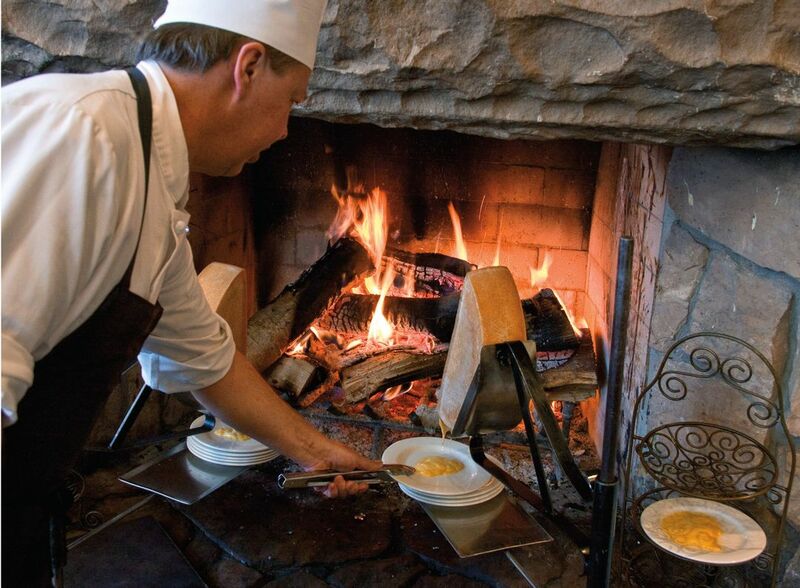 Alongside tolerating the constant heat and maneuvering a dozen or more plates with tongs to keep the cheese evenly melted, raclette servers at Deer Valley’s Fireside Dining (Empire Lodge, 9200 Marsac Ave, 435.645.6632) also keep up a friendly banter with patrons who are inevitably fascinated by the culinary virtuosity. Managing a half-wheel of semiprecious imported raclette as it melts beside a hot fire takes the art of serving to masterpiece level. Open only in winter at the resort’s Empire Lodge, this moveable feast is as authentically Swiss as it gets outside the Alps. Diners meander from fireplace to fireplace, filling plates with gorgeous salads, roasted leg of lamb, sumptuous stews, and a host of weekly specials. At the ever-popular raclette station, the feast includes pickled vegetables, charcuterie, and bread—all for swirling in that perfectly melted cheese. With any luck, your fire-keeper will tell you that the tradition originated with shepherds in the Alps. The story goes like this: one night, someone accidentally left a wheel of cheese by the fire. When the shepherds discovered the oozing cheese, they scraped it onto bread and fell hook, line, and sinker for the way the melted cheese combined with their typical pickled and preserved fare. They started melting the cheese on purpose, and a simple tradition was born. One taste, and you’ll thank Macias and the Deer Valley crew for being game to take the heat.